Sunlight from above right illuminates this scene, casting shadows to the left. From left to right: Mary Magdalene, Jesus the Christ, Zacchaeus, a servant holding a basket of linen. 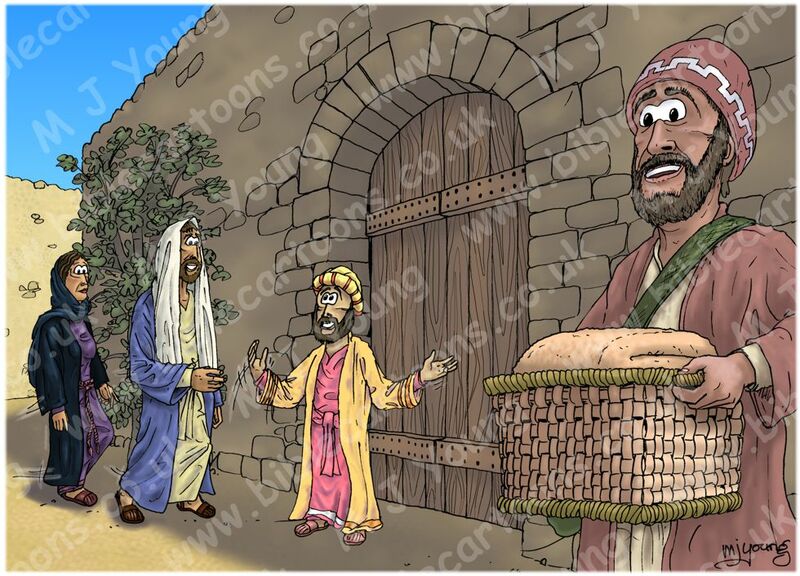 01) (This page) Luke 19 – Zacchaeus the tax collector – Scene 05 – Excited (Colour version). This version doesn’t have the strong cast shadows and sunlight present on the foreground figures. 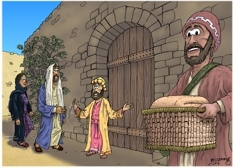 02) (Next page) Luke 19 – Zacchaeus the tax collector – Scene 05 – Excited (Sunlight version). This scene contains strong sunlight and cast shadows covering the foreground figures. Although this scene occurs in the story before the next scene, I actually drew and coloured it up after scene 06. 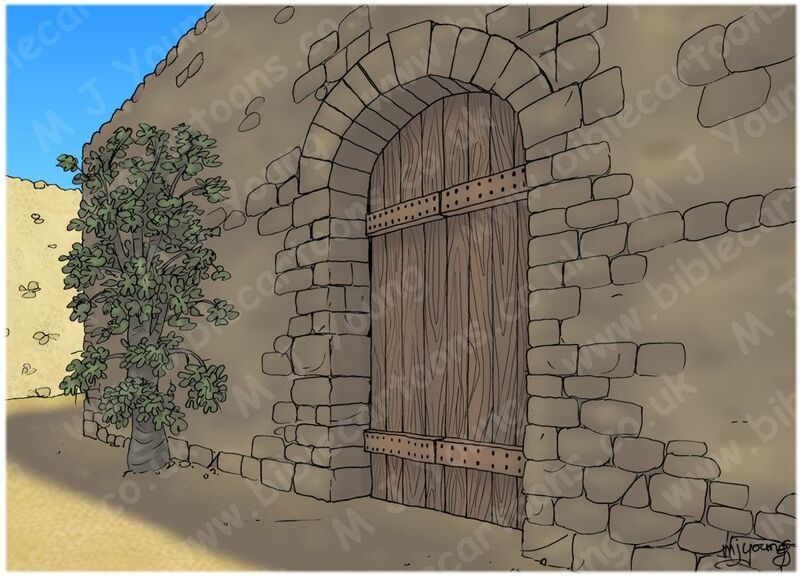 I have used the gate, archway and walls I designed for Scene 06 and have produced this scene from it. The viewer is looking back from the right hand side of the gate at the figures approaching the doors. In Scene 06 the viewer is looking from the left hand side of the gate, towards the right hand side of the wall. Notice there is a fig tree growing close to the wall in this view, which the figures of Mary Magdalene and Jesus the Christ are passing as Zacchaeus, their host, leads them to his front door. As the verse 6 points out (see above) “Zacchaeus… took Jesus to his house in great excitement and joy.” I hope I have convayed some of that joy in Zacchaeus’ expression and gestures.